Having left Niger, we drove around 12km on a bearing and reached a new Algerian customs post. We presented ourselves to the officer with our halting French, and he said, in English, 'Speak either English or French'. So we spoke English. He dealt with our passports relatively swiftly and then sent us round the other side of the building to customs. This took a little longer, as there were 2 trucks already waiting. We heard many horror stories about Algerian customs and immigration searching vehicles and confiscating binoculars (which we had hidden in case) and the like, but thankfully we experienced none of this ourselves. After around 20 minutes, we were called in to the office, and sat while the officer filled out his books and stamped the carnet and completed a currency declaration sheet. He was very meticulous - he had 8 different books on his desk and made a point of explaining the requirements for each to us. We were asked how much foreign currency we had, whether we had a mobile phone and a video camera. When he had finished, another officer came out to search the vehicle, but in the event he only checked the chassis number, and then we were free to go. Another 12 km north and we reached In Guezzam. By now it was around 4pm. It was very quiet, almost deserted, and we had trouble finding the Gendarmerie. Once found, we sat in a small office whilst the policeman laboriously translated the details in our passports into Arabic, and asked us the names of our parents, which also had to be translated. Finally, when he had finished, we asked whether there was any fuel. He went to find out, and coming back, he said there was none, and asked us whether we were staying the night. When we said no, he asked us to wait, as the chef de brigade wanted to speak to us. The chef was insistent that we should stay the night, and told us to pitch our tent just outside the walls of the gendarmerie, on the street. For some reason he did not want us to be inside the compound, though he said that we could use the bathroom facilities there, and ring the bell if we wanted anything during the night. He stressed that safety was not an issue in this town, and it was Ramadan, so nothing would happen to us. In the end we agreed, and he told us he would sort out some fuel in the morning. 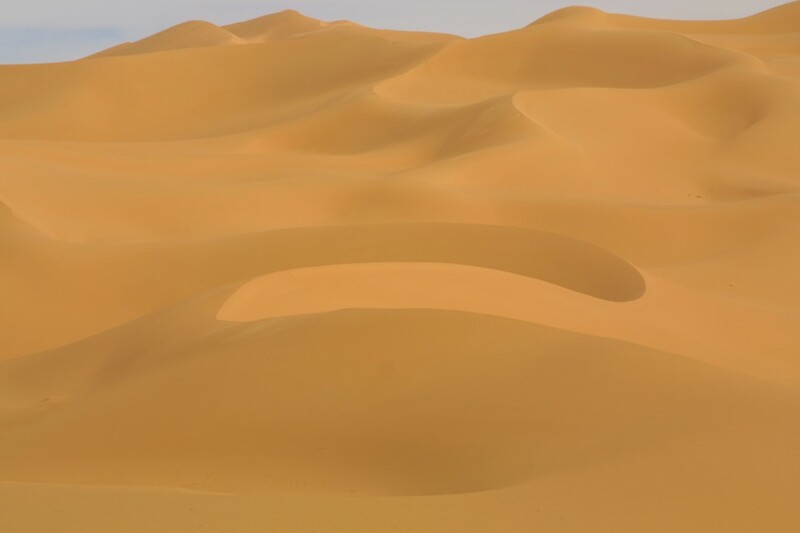 Although we were disappointed not to be camping alone in the desert, the evening was not too bad, and the chef turned up after dark, asked for two empty jerry cans, and then returned with them full of diesel. When we asked the price he was insistent that we should not have to pay for them and they were his gift to us. Having initially not been sure whether we needed extra diesel or not, because of the soft sand, we found we were glad of this extra diesel the next day. Initially the road out of In Guezzam was tar - for 20km. Then it deteriorated, though was still relatively easy to follow. 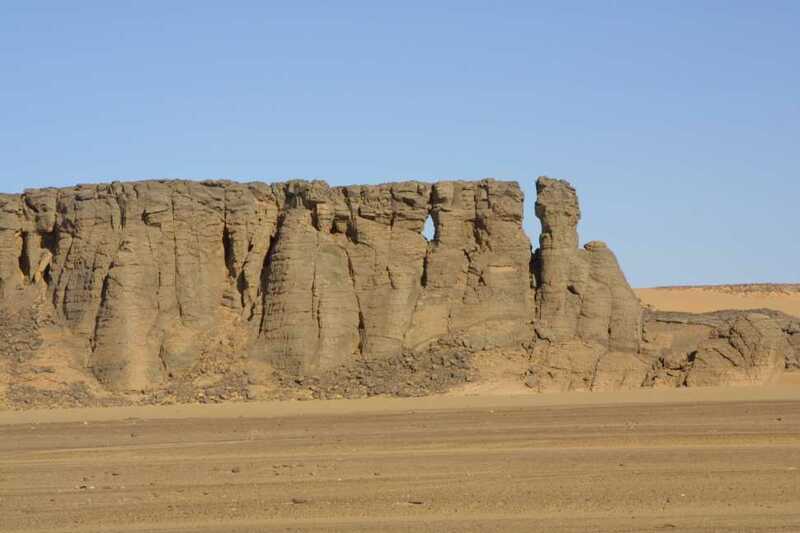 There were concrete marker posts for Tamanrasset every so often. 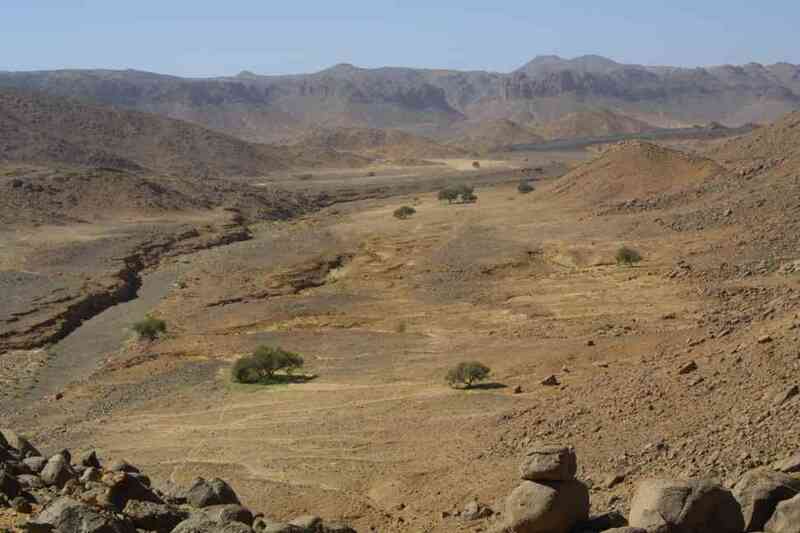 The piste became fairly open until 160km from Tamanrasset, and then we entered a river bed, where the route swings about. There was a graded gravel track 80km from the town, with some corrugations, though these were not serious. At 62km out, there was some good tar that then became graded gravel again, and at 30km out the tar re-appeared, though with some potholes. We had been recommended a campsite called caravanserai, which is signposted in the town. The owner told us that we could register with him and he would pass our details to the police, to save us having to register with the gendarmerie. He also offered to change some US$s for us, which was very helpful, since we still had no local money and all the banks were shut - since it was Ramadan the hours were slightly erratic. At the campsite we met 4 bikers, an Austrian couple and 2 German guys. They had travelled down from northern Algeria and were very helpful with information about routes. They had a guidebook, which was in German, giving GPS routes and other useful background information about Algeria. We noticed a large number of Europeans in the town, mostly French and German, and largely travelling in groups. We did not meet any English people. 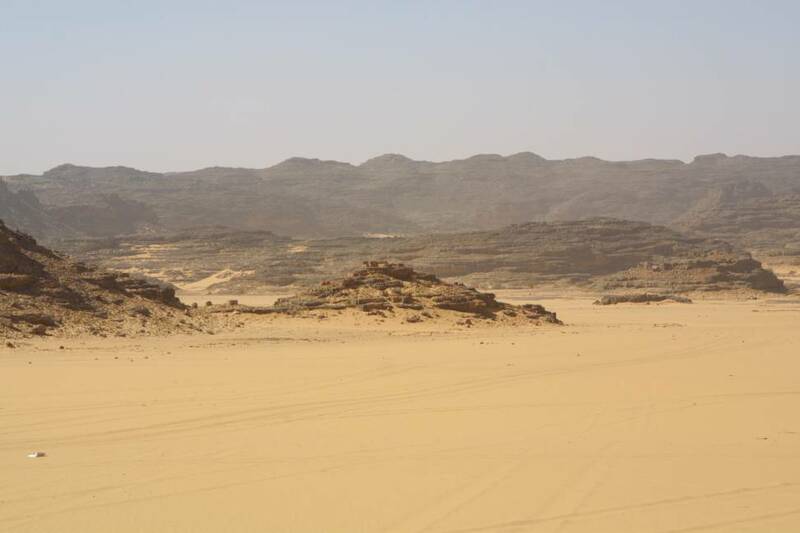 Fuel was a problem in Tamanrasset. We had read on a website that we should go to the gendarmerie to ask for assistance in obtaining fuel. There was no diesel available that evening, so in the morning we went to the petrol station, only to be told that diesel would not arrive until 2.00pm that day. We returned to the campsite to wait until then. On reaching the petrol station, there was a large crowd of locals, together with a long queue of vehicles, making it impossible to reach the pump with a vehicle. We waited a while, and in the end went to the gendarmerie to ask how we should proceed. We were given 3 officers, one of whom separated the crowd and gained control of the fuel pump, permitting us to dispense 80 litres (4 jerry cans) and the others helped to control the crowd and organised a boy to carry the cans back to the vehicle. He also helped pour the diesel into the car. All our attempts to pay were refused, and the officers said there was no problem, so we drove off. 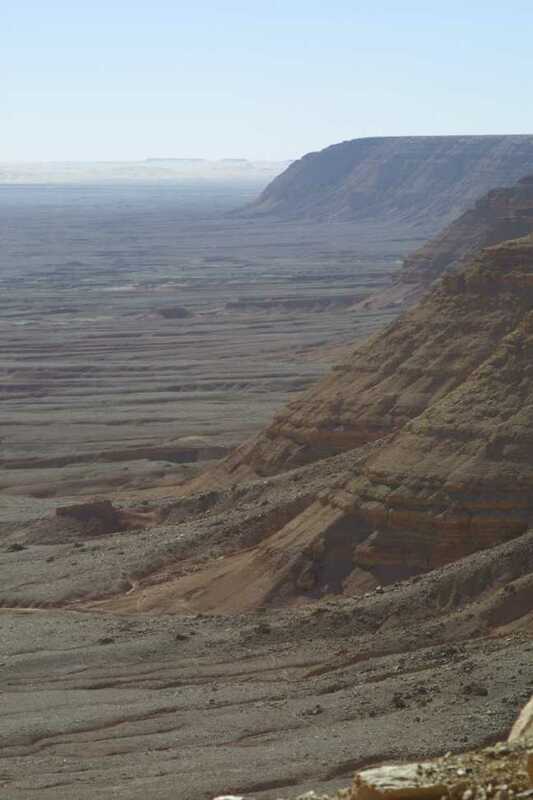 Although Assekrem is one of the dominant features in the Hoggar Mountains, we received mixed information about the value of seeing it, but we were told several times that the descent was difficult at best, and there was a high risk of damaging the vehicle. At this stage in our journey, our thoughts were more towards getting Daph home in one piece, together with the fact that our tyres were fairly low on tread following our experiences in Ethiopia. We decided to go north around Assekrem before taking the direct route across to D'Janet. We drove north on the N1 for 100km before turning off on the road towards Hirhafok. The dirt road was OK, though there were mild corrugations in parts. After 50km, we pulled off into a river course, and camped for the night behind some rocks. The next morning we passed through Hirhafok, and carried on to Ideles, where we noted there were fuel pumps, though we did not stop. The road out of Ideles was confusing, and you have to drive over volcanic scree before you hit the piste beyond the next hill. Once on the piste the motoring was quite easy, although for 50km you drive through a very sandy river bed. Around 50km before you reach the village of Serouenout, the road swings distinctly south, and numerous tracks disappear in that direction, but our GPS was telling us to carry on east (despite no tracks in that direction and a large mountain ahead of us). Hitherto the GPS had been extremely accurate, so we followed the bearing, despite the ground information. This proved to be correct, as we threaded our way through a narrow valley, which in fact turned out to be the direct route to Serouenout. We stopped early, before reaching the village in a narrow valley, as we needed to check Daph's rear diff, which had been leaking for a few days. Although the wheels were chocked with rocks, we used the hi-lift jack to improve access to the rear diff. The sand underneath the hard crust must have been softer than expected, for the thick plank of wood on which the hi-lift sat snapped before we could get the jack stand underneath the axle. Daph was suspended against the hi-lift jack which had slipped sideways, thus the weight was taken up by the spare wheel carrier, against which the top of the jack was now jammed. We used the bottle jack to take the weight to stabilise the car, then we had to dig out the hi-lift jack to remove it. On removal, we found that it was slightly bent - though still functional. The 30 minute task to repair the rear diff eventually took 1.5 hrs! In addition, we appeared to have another problem in that the alarm was now malfunctioning, so that every time one of the side panels was knocked, or a door closed, it emitted a beep. Attempts to re-set the alarm with the emergency code were unsuccessful, and we ended up with a continuous noise, so we were forced to unplug the main car battery for the night. The following morning we re-connected the battery, and the alarm seemed to be fine. The village of Serouenout was simply a fort occupied by gendarmes, who were very friendly, and wished us a bonne route. The piste to Borne was wide, open and relatively free driving, though there were distinct and rather unpleasant corrugations on the track, which were easily avoided. 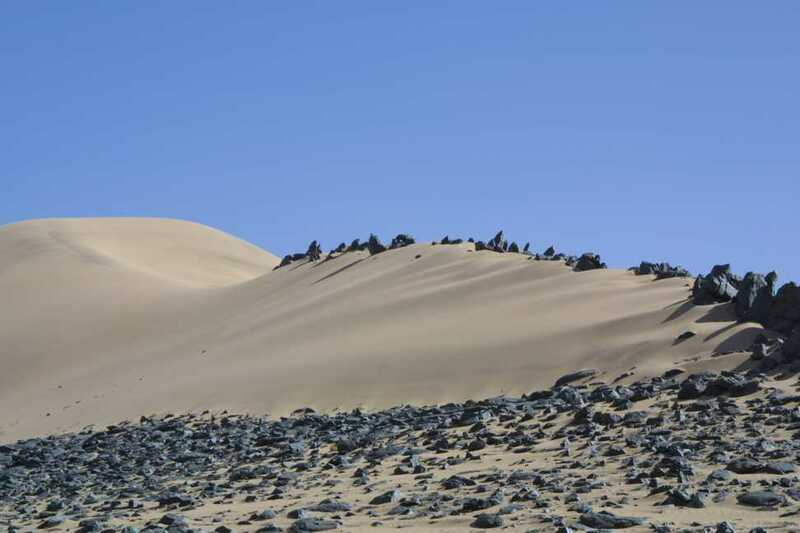 There were occasional rocky ravines to cross, and some areas of deep sand. There were a few ridges and bumps on the piste that care is required to avoid. 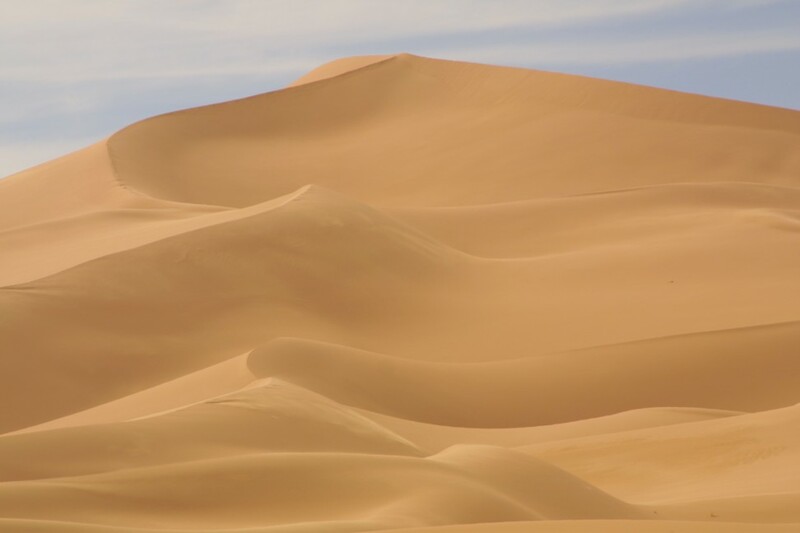 A balance is required between sufficient momentum to float over the sand crust as opposed to slower speed that would require high ratio second and third (more expensive on fuel) but you would avoid all the bumps. The village of Borne (spelt 3 different ways) is simply a brick arch in the middle of nowhere. The right turn here takes you to Borges el Haoues on an uncomfortably corrugated rocky piste, which is well marked. Borges el Haoues is a strange town, lying on the main road. It is a ribbon development, and there is a dual carriageway through the town. A tar road from here now stretches all the way to D'Janet. 5km south of Borges is a petrol station. We were charged 70,000 for 60 litres of diesel, which is actually 700 dinar. It is necessary to be quite careful with prices, as in some of the other North African countries. The 120km of tar to D'Janet was relatively well maintained, and there were some stunning vistas along the way. Unfortunately over the last 3 days the visibility had not been good, so we were not able to take many pictures. D'Janet also has ribbon development along the oasis and the road that runs parallel. There are houses built into the hillside. Fuel is available, and the market is good for fruit and vegetables. The locals were extremely friendly, and they insisted on taking change from us rather than notes. We camped at La Belle Etoile, on the southern edge of town, where again the alarm was playing up. The owner of the campsite said that he would get a mechanic to come to the campsite and inspect the problem, as again we had to disconnect the battery. We met a French couple who were spending 4 months travelling south, doing a clockwise circuit south from Algeria through Burkina Faso, Mali, Mauritania and home through Morocco, which confirmed that it was now possible to travel south to north through Mauritania (previously this journey was only possible from north to south). They also told us of a Swiss couple who, 2 weeks ago were robbed in the Tenere and the girl assaulted. Luckily other tourists quickly found them. One of the reasons we did not visit this area was that we also are a lone vehicle and were aware of the security risk. The campsite owner's promised mechanic failed to materialise that evening, so we went to see him the next morning. Unfortunately the mechanic was no more the wiser than Adrian on the electrics of Land Rovers, especially our model, so after he had a thorough, yet fruitless inspection Adrian got him to disconnect the horn to allow us to carry on north. We retraced our steps back to Borjes and carried on towards Illizi. The whole route was on good tar, except for the detour we took to Ihere. We had gathered an impression that Ihere was a delightful, isolated oasis with a small settlement and subterranean water systems within the surrounding hills. Whilst this may be so, when we dropped down into the valley floor, a large sprawling community and a checkpoint demanding an entrance fee for the National Park greeted us, within which a guide is compulsory. 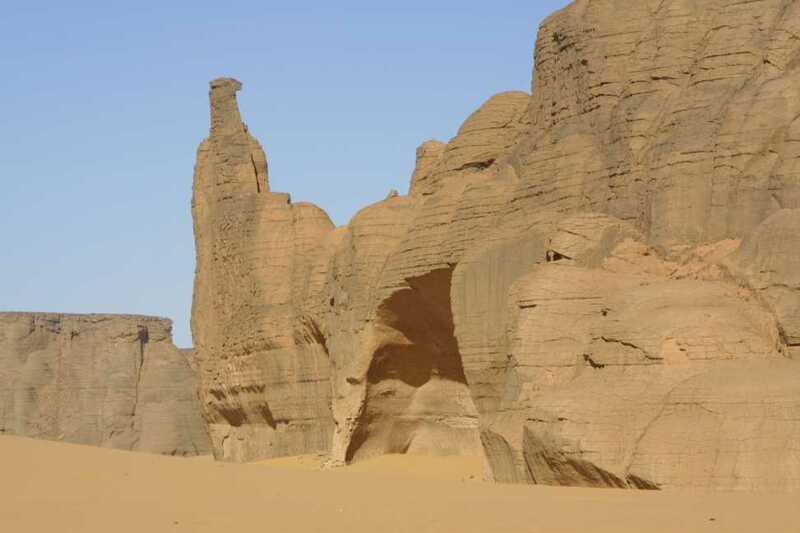 'Naturally you will want to trek to see the rock carvings? - How many days will you be staying?!!' At that point we turned around and drove back the way we came, very annoyed at the hard sell and aggressive manner, quite contrary to that we had experienced in Algeria to date. We continued towards Illizi, but time was against us. Thankfully Hilty's GPS coords stopped at a campsite on the southern edge of Illizi town, where we stopped and also enjoyed our first meal out in Algeria at the campsite restaurant. Later that evening 3 German vehicles pulled into the campsite. They were quite surprised about our journey and the following morning one of the men came over to present us with 2 cans of German beer, saying he thought we need them (he was right, they were extremely welcome). Our next leg was onto Dep Dep, close to the Libyan border, but again all on tar. This was quite a boring stretch of flat expanse of desert, with evidence of tighter security due to the oil fields in the vicinity. Dep Dep itself is a 'one horse town', so after refuelling, we drove on at last light and camped in the desert. Our spot was quite surreal and totally isolated. 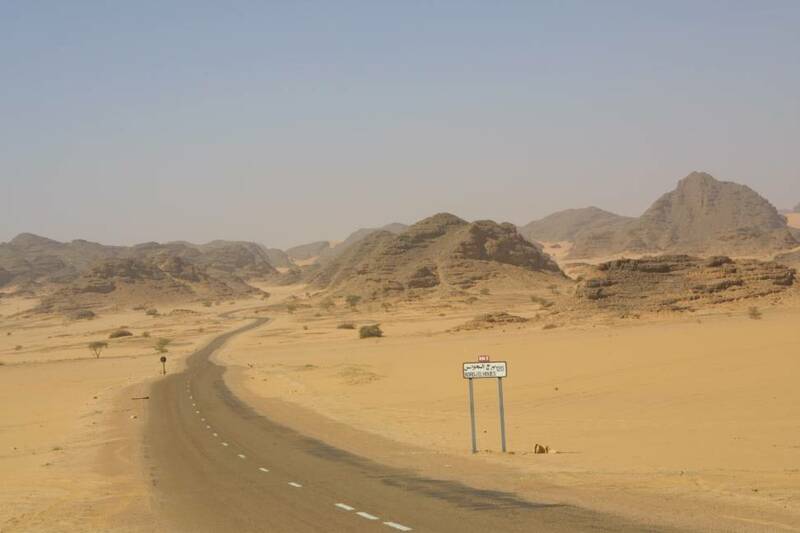 Our route from Dep Dep ran north for around 250km, before we swung west for a similar distance to Hassi Messasout. This leg sounded better that the reality, for there was a tar road for much of the way, except for 100 km of the northerly section. Here 30m high sand dunes had blown across the road, in many areas completely obliterating the road. 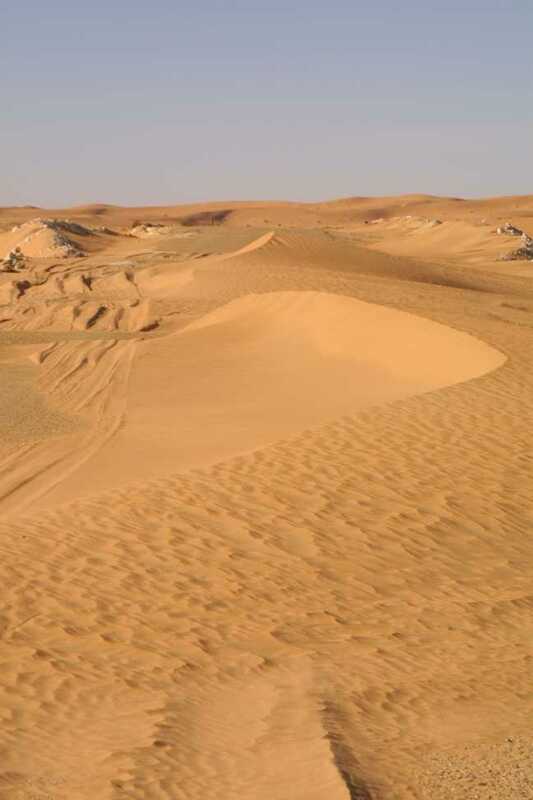 Beside the road was a sand track, which although the sand was soft, it was perfectly drivable in normal or high range. Interestingly the track was a constant feature, with no sand dunes across it, where as the road suffered badly from encroaching sand. 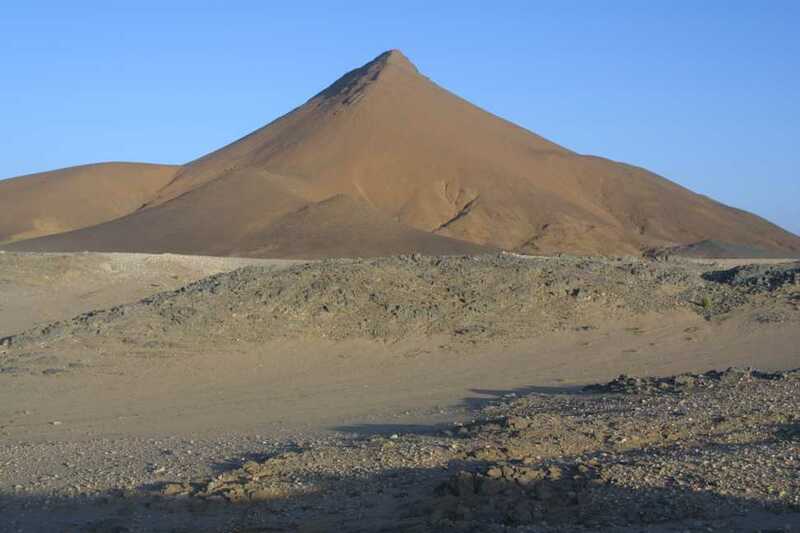 We reached Hassi Messasout late in the day and after refuelling, we attempted to find accommodation. 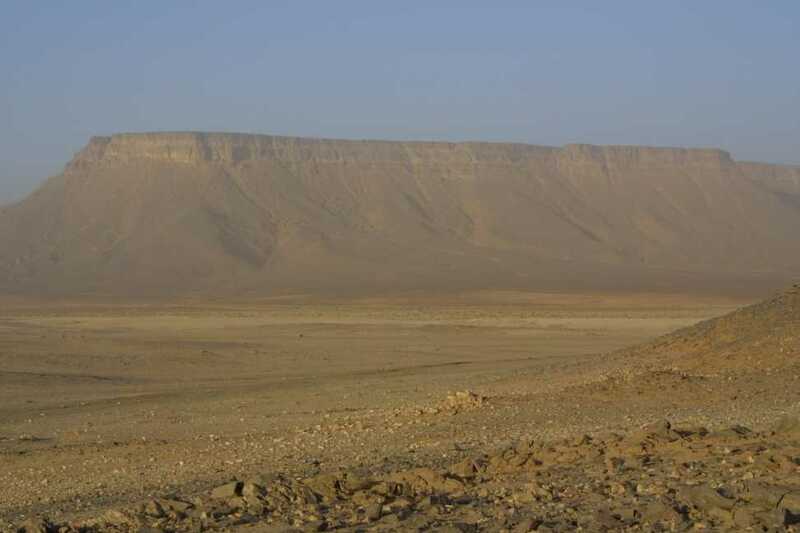 Thoughts of camping in the desert were fruitless, for the whole area was flat and featureless. We found no accommodation is Hassi, indeed the town was quite unwelcoming, with the air of a new town developed from the need to support the oil fields to its south. We pressed on in fading light to Tougourt, in the hope of finding either accommodation, a campsite of a desert camp spot. On arrival at Tougourt, we had the sinking feeling that the town was similar to Hassi, but we were proved wrong. We asked the way to a hotel at a cafe/truck stop, where upon a smart chap offered to show us the way to the 'Wassim' Hotel. We followed, and we came to the Oasis Hotel, quite a smart place (if a little faded from its previous grandeur). The chap was insistent that a 'cadeau' was quite unnecessary, indeed he was prepared to loan us money should we have insufficient, until the banks opened in the morning! The Oasis was obviously one of many hotels on a tourist circuit around the oasis towns. Now it was a trucker�s stop. The main advantage for us was that we were able to park Daph behind a large wall, within a locked and guarded compound, not that we were expecting a problem in Tougourt. The hotel restaurant had closed (it was Ramadan - although it was also after dark??) so we cooked some food again in our room (avoiding setting the place on fire like last time in Niger!). Breakfast was between 0600-0930 hrs, but at 0630, all the lights were switched off and the receptionist was asleep! Adrian woke him up; only to receive the excuse about Ramadan and that in 5 minutes we could have breakfast. 15 minutes later we received some stale bread and coffee. We had heard that stone throwing children were a problem between Tougourt and El Oued, but as we tackled this stretch early in the morning, we experienced no problems and reached the border at 0930hrs. The Michelin 954 1:1 million was surprisingly accurate. The 'Africa on a Shoestring' was useless as all it would say was it is too dangerous to travel - thus no information was given. Whilst not being cavalier about safety, we met many people with either a German or French guidebook on desert or Sahara travel - though we are not aware of a similar English translation or guide, other than Chris Scott's excellent book, which again has no detailed Algerian routes (yet?). However the GPS and Quo Vardis were invaluable. This is where Peter helped us enormously, loaning us his 1:700,000 maps and downloading 1:200,000 maps onto Quo Vardis. He equally gave us 5 excellent and challenging routes on to our GPs, which we broadly followed and found to be up to date and accurate (even when they deviated from the track!). 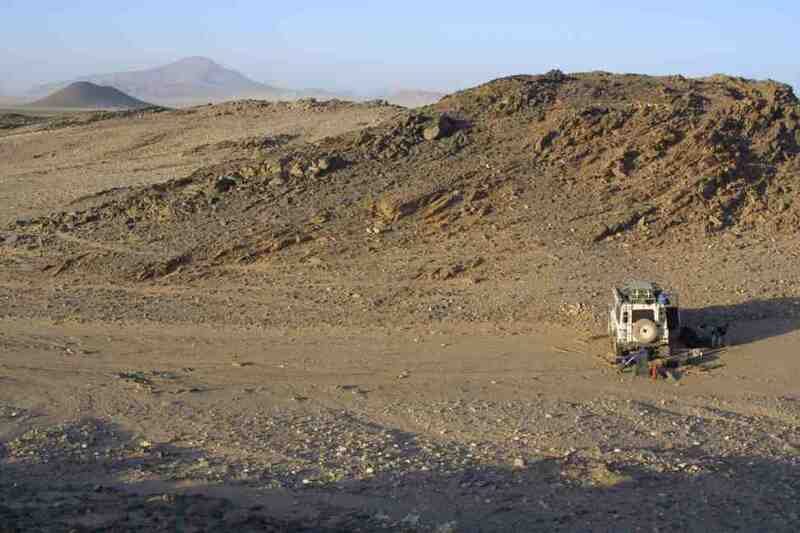 In the desert, GPS really comes into its own and is an indispensable piece of insurance! 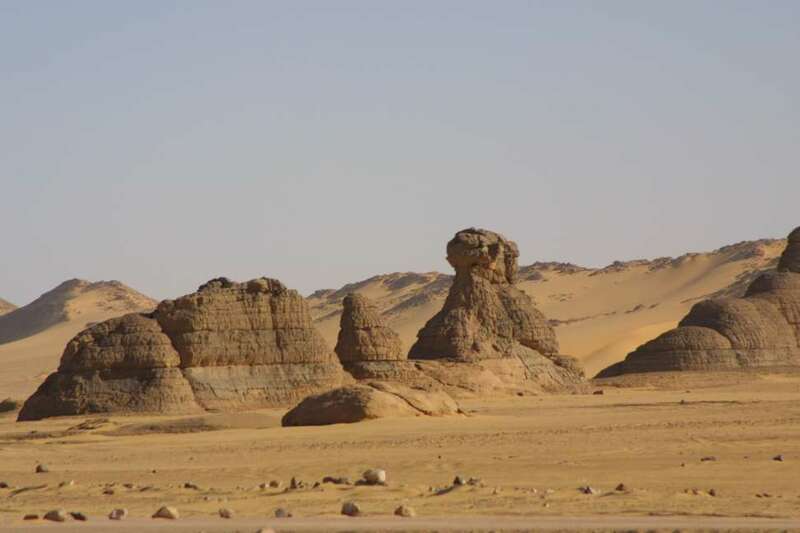 Algeria, especially the Hoggar mountains, were a popular adventure location prior to the Tuareg insurrection in the 1990s, especially with their former colonialists - the French. Since peace has returned, we found the Algerians to be extremely friendly. Despite the obvious requirement to register at each major town with the Gendarmerie, this had little effect on our travels (in fact we achieved this through each campsite we stayed at). Interestingly we noted large numbers of other European tourists (mostly retired French and Germans) the majority of whom were travelling within large groups. This was the first time we had seen European travellers since Kenya! We had heard stories about the border formalities taking several hours, yet our experience was one of general efficiency - both border crossings took an average amount of time when compared with all the other borders we had crossed during our journey and we were not messed round at all. The people seemed to be genuinely pleased to see tourists, and interested in our journey. 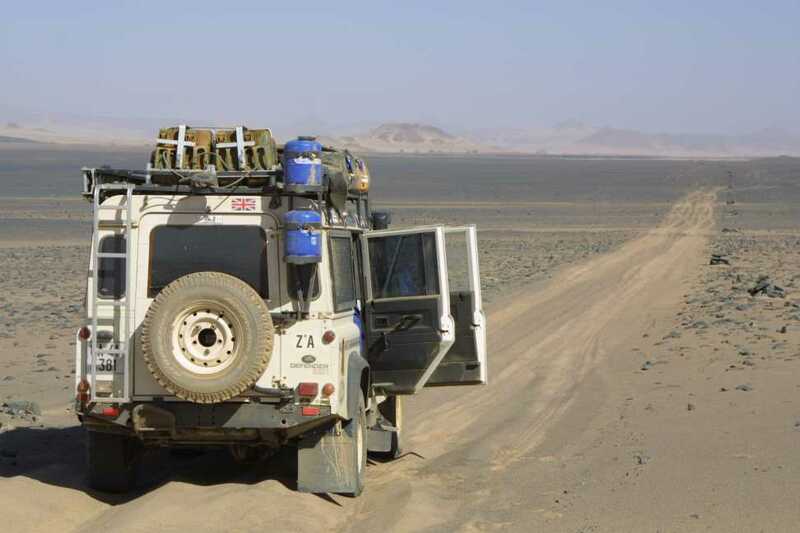 We believe our journey was out of their normal experience - not many overlanders take this route. We were very lucky to receive 120 litres of free diesel from the Gendarmerie. 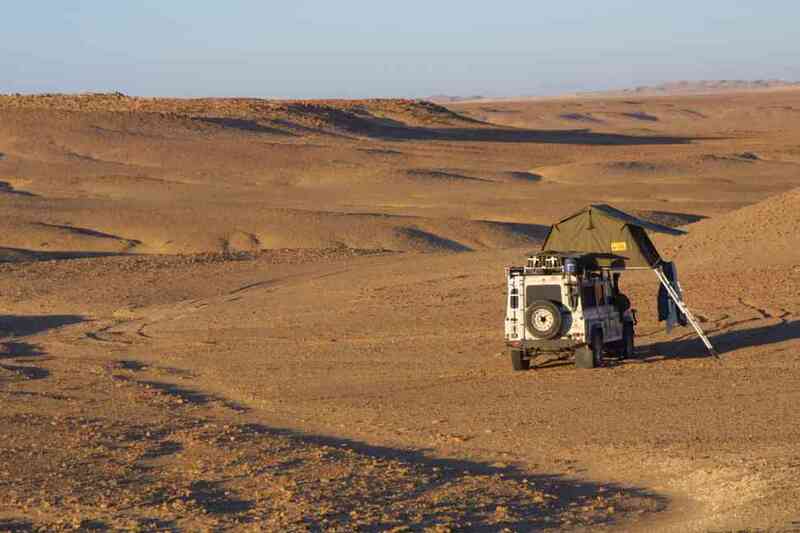 Their assistance at Tamanrasset was invaluable given the general m�l�e of locals yelling at each other in Arabic over possession of the fuel pump. 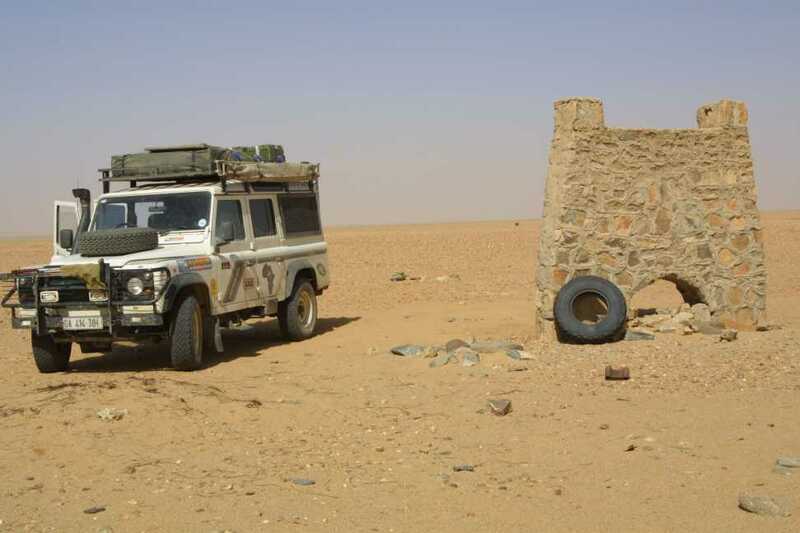 It was strange that fuel was a problem in Tamanrasset, since it was freely available everywhere else, including Borjes and D'Janet, where we estimated that there were an equal number of tour companies who required fuel. The mountain scenery and the dunes were inspiring - it was wonderful to be able to bush camp so safely amid such dramatic surroundings. 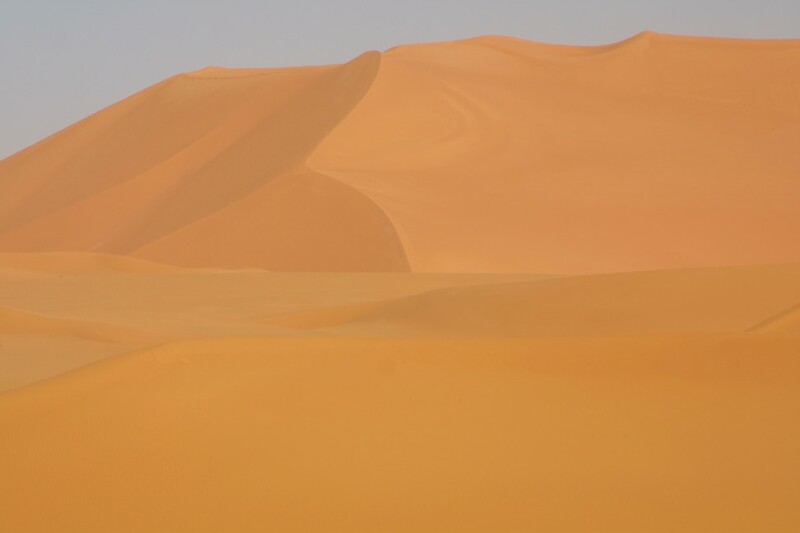 There was a real feeling of being out in the wilds, and the Sahara is certainly a fantastic place. 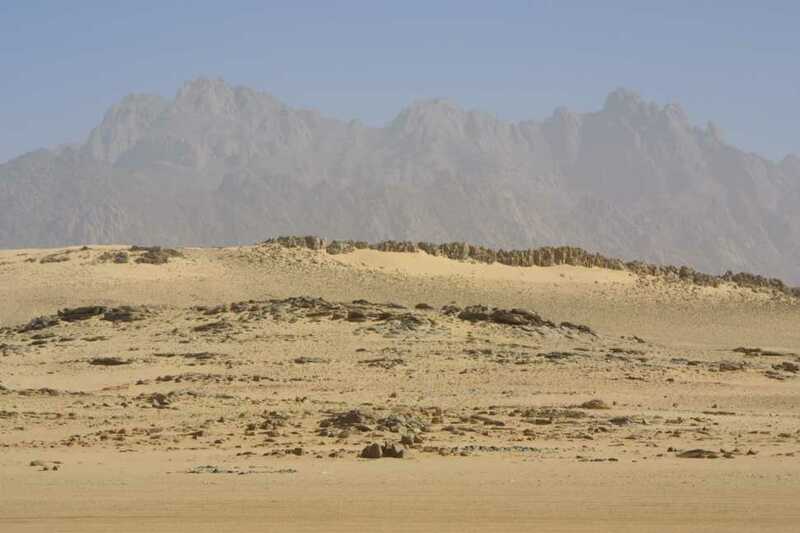 There were a variety of pistes, some sandy and others rocky, some surrounded simply by flat sand, others by mountains. There was an incredible feeling of space and freedom. Algeria also appeared to have a reasonable infrastructure - the network of roads was impressive - where these existed they were generally in relatively good condition (although may run contrary to desert purists desires). French produce was freely available within small supermarkets. All in all we greatly enjoyed our time in this country, and were sad to leave.